It didn't take many swings in the cages or in batting practice from Cal Raleigh for Everett hitting coach Eric Farris to mutter to himself, "Man, this kid's a monster." The switch-hitting catcher gave the public a glimpse of that side of him on Saturday. The Mariners' No. 13 prospect slugged his first two Minor League homers, going yard from both sides of the plate to power Class A Short-Season Everett to a 12-5 romp over Salem-Keizer at Volcanoes Stadium. "He's a big strong kid right out of the gate," Farris said. "He's got some power and some lightning-fast hands and can get to the ball with a pretty short and compact swing. It's going to be good when he sees more velocity. ... He's got a really good feel for the strike zone and he's definitely an advanced hitter." The third-round pick in last month's Draft lifted a solo shot to right-center field off right-hander Alex DuBord from the left side in the fifth inning, then went deep again from the right side of the dish in the eighth against southpaw Greg Jacknewitz. "It was a cool experience," said Raleigh, adding he'd never homered from two sides of the plate before. "Definitely something I'm going to remember for a long time, and I've been trying to get into my rhythm after being off for about a month and a half and it's harder than it seemed to get back in. But, yeah, it was good and I'm seeing the ball a little better now and hopefully in the coming weeks get back in my routine and my rhythm and hopefully contribute." 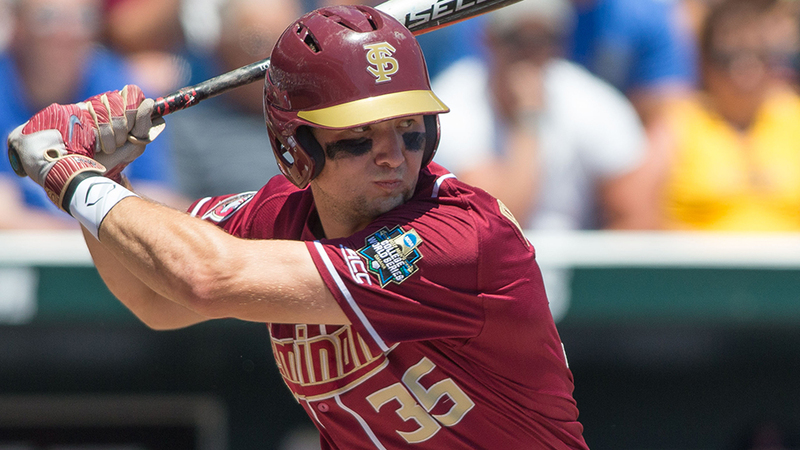 There's been a lot for the Florida State product to adjust since reporting to Everett: long road trips, swinging a wooded bat, changing time zones. But nothing has been tougher than reacclimating to live baseball. "Especially from me coming right off of the [NCAA] regionals, I just wanted to get out there and play," Raleigh said. "It was hard for me to just sit around, although I had to keep lifting and running and working on my swing, but it definitely showed in my first week or two playing." Raleigh also doubled, going 3-for-5 to raise his average 75 points to .229 and his OPS to .746 through eight games in the professional ranks. The switch-hitting catcher from North Carolina reached a deal with the Mariners at the July 6 deadline for a reported $854,000 signing bonus, well above the $632,700 slot value. Scouts believe he can be an exciting hitter with raw power, especially after a breakout junior season with the Seminoles in which he batted .326 with 13 homers and 54 RBIs. Geoandry Montilla contributed two hits and three RBIs for Everett, while Charlie McConnell went 3-for-4 with two RBIs out of the ninth spot in the lineup. Seven AquaSox had at least two hits, including Ryne Ogren, who scored three times. Josh Horton is a contributor to MiLB.com. Follow him on Twitter @joshhorton22 This story was not subject to the approval of the National Association of Professional Baseball Leagues or its clubs.